The Rubbermaid Clean & Dry™ plunger helps keep your bathroom cleaner and more sanitary. Traditional plungers pick up germs and bacteria that can spread when dripped on floors or in cabinets. The Clean & Dry plunger head and pole is protected with NeverWet™ coating, which forms a protective shield around them that water cannot penetrate. It works like car wax, the water beads up and rolls off instantly. This plunger outperformed my normal rubber plunger with a wood handle. I have issues with my hands and sometimes holding onto things can be painful. While I usually bite the bullet in regards to the pain, I found that with this handle it was easier to handle and hold and did not cause my hands to be in as much pain as with a hard wood handle. 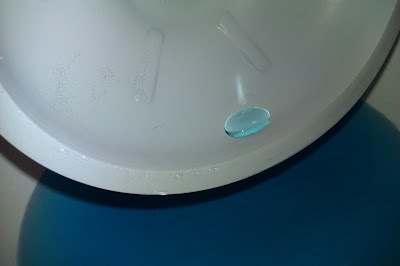 The NeverWet coating really does repel water, it just slips right off! I found this to be fascinating. My family uses the plunger fairly often, at least once a week. Our home is 1920's and the plumbing is obviously quite old so sometimes it needs some coaxing. The Clean & Dry Plunger stood up to the test, it plunges just as well as my other plunger but saved me from having to clean up a gross mess on the seat or floor. I plunged the toilet, gave the plunger a light shake and it was almost completely dry! Our other plunger would have left a nasty wet mess on the floor. Anything that saves me an extra step is more than welcome in my home! My only wish was that this included some kind of holder or hook so that it could be stored better and that the handle was white and not black to fit in with my bathroom colors better. I keep the plunger sort of behind our toilet off to the side so that it can be employed in an emergency. See how the water just beads? It's awesome! 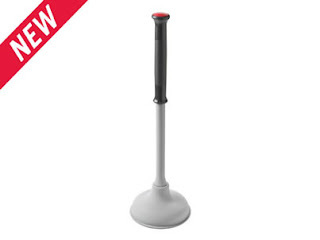 On the Rubbermaid website you can purchase a plunger 1 or 2 pack, the 2 pack looks like a fairly nice deal for only $19.99! Enter below to WIN one Clean & Dry plunger!